I spent the past week visiting a lovely, small hotel on the rugged western coast of Ireland. Unfortunately, it was all in my imagination. That is the setting for Maeve Binchy’s new novel, A Week in Winter. Visitors to the Stone House hotel in fictional Stoneybridge, Ireland find renewal for their troubled souls and an optimistic vision for the future within its restful walls and along the wild Atlantic coast. All of Ms. Binchy’s books are warm, comforting and intriguing, and I love the way she brings characters from previous books into her latest novel. Sadly, Ms. Binchy passed away in July, 2012. I guess I’ll just have to go back to her first novel and read through them all again! When I finished A Week in Winter, I didn’t want to leave Stone House, especially it’s large, warm kitchen where everyone gathers for breakfast and dinner. I decided to cook-up a food item served in the book, and the one that stood out for me was brown bread. I’ve made Irish soda bread many times, but never this one. 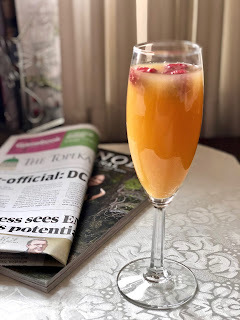 So, with St. Patrick’s Day fast approaching, I decided to give it a try. In my research, I found a lot of brown bread recipes were very similar to soda bread, with the addition of whole wheat flour, wheat germ and molasses (or black treacle). Then I came across this one for a yeast brown bread from the famous Ballymaloe House Hotel and Cookery School in County Cork, Ireland. (It’s at the top of my bucket list of places to visit before I die.) Since I had great success with their orange marmalade tea cake I made last year, I decided to give it a try. This recipe is so simple: No kneading! Only one rise! Just five ingredients! Don’t expect a fluffy, soft wheat bread like we have here in the U.S. This brown bread is dense, but also moist. It is perfect cut into thin slices and spread with good, real butter. I also liked it with honey and jam, as well as served with a good Irish cheddar. Spray an 8 by 5-inch loaf pan with non-stick spray, or grease well with oil. Set aside. Pour 3/4 cup of warm water into a small bowl. Sprinkle the yeast on top and allow it to sit for 5 minutes. Stir to dissolve the yeast, add the molasses, and leave for another 10 minutes. The yeast will become frothy. Add another 3/4 cup of warm water and stir to combine. In a large bowl, whisk together the whole wheat flour and salt. Make a well in the middle of the flour and pour in the yeast/water mixture. With a wooden spoon (or your hands) mix the flour and water together. Add more water if necessary. The dough should still be wet and sticky—too sticky to knead—but come away somewhat from the sides of the bowl. Place the dough into the loaf pan, cover with a towel, and allow to rise until the dough just reaches the top of the loaf pan, about 20 to 25 minutes. Preheat the oven to 425 degrees while you wait. When the dough has risen enough, bake for 30 minutes. Then lower the oven temperature to 400 degrees and bake for another 15 minutes. Turn the almost-done bread out onto a baking sheet and bake, upside down, for another 5 to 10 minutes so the outside crisps up. The bread is done when it sounds hollow when you tap on the bottom, or when the internal temperature reaches 200 degrees. Cool on a wire rack. I was just looking for a different bread recipe than soda bread. This sounds perfect. I hope you don't mind I swiped the link. I like a denser bread from time to time and I just restocked my wheat flour. Hope you are having a good week. Gina, you'll have to tell me what you think if you make it! Enjoy! Ahhhh poor Maeve. I was a big fan and she was quite a character. I am also a big fan of good brown bread. Looks like you have nailed it with your Ballymaloe inspired loaf, Linda! 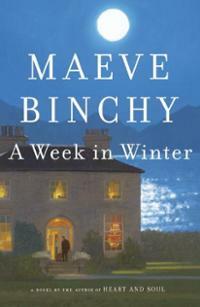 I haven’t read any of Maeve Binchy’s books, but I know I will be looking for "A Week in Winter”. It sounds like a wonderful read. I’ve been lucky enough to visit Ireland and it is such a magnificent country! I love the Ballymaloe House cookbook. I wish I knew about it when we visited…it would have been at the top of my list! Your bread is perfect for St. Patrick’s Day…delicious looking! I love Maeve Binchy and haven't read that one (although I am not sure I need more winter in my life right now). I was just thinking about rereading an earlier one! The bread is just grand - loving how dense it is - it does indeed stand up to cheddar - or a rich jam. I've never made bread like this and can't wait to try it. I love the idea of not kneading the dough. I like my dense bread and this seems so good to try! Have you ever used Hudson Cream flours? They're milled in Kansas. I first heard about them from a Sunflower Journeys episode on KTWU. I do now, Jayhawk! Gotta keep our money in Kansas, right? I used King Arthur flours when I lived in New England and kept using them after I moved to Kansas. But in the last couple of years I've switched to Kansas flours to help keep my money more local.